Beans, beans, good for your heart—and just about every other part of your body too! Not only are beans low in fat with no cholesterol; they are also packed with fiber, high in protein and loaded with antioxidants. 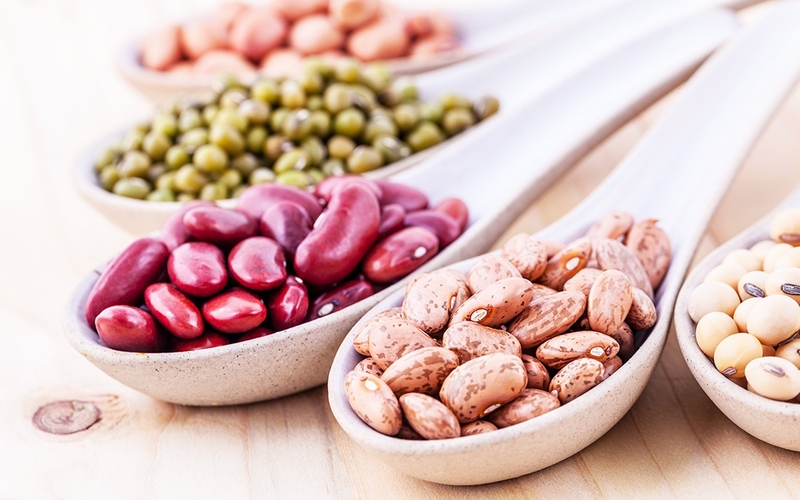 Beans have long been a go-to source of protein for vegetarians, but recent studies showing that consumption of these nutrient-rich legumes can help ward off a number of health conditions are making them a staple for meat lovers as well. For some people, knowing beans are a healthy choice is not enough of a reason to put up with the intestinal gas that eating them can produce. Thankfully, there are a few things you can do to mitigate this problem. Start by soaking sorted, dried beans for 12 to 15 hours before cooking. Pour off the water used for soaking and rinse several times. Adding herbs such as cumin, turmeric, coriander, fennel or garlic to cooking beans also seems to diminish the phytic acid that causes flatulence. If you opt for the convenience of cooked, rinse canned beans before serving to reduce sodium levels or look for low- or no-sodium options. The five beans listed below are some of the most popular, and all fall in the USDA’s top forty most antioxidant-rich foods. Pinto beans have a beige background with red-mauve splashes of color when dry, and turn a rich brown color when cooked. Like all beans, they are full of soluble fiber, which helps lower cholesterol and keep blood-sugar levels steady. Pinto beans are also a great source of folate, protein and vitamin B1, as well as the minerals iron, magnesium, manganese and potassium. Serving suggestions: Try pinto beans in chili in place of kidney beans, add to veggie soups, or purée cooked pintos with fresh herbs to make a spread for crackers or crudités. Red kidney beans hold their kidney shape during cooking and absorb flavors well, which makes them perfect for simmered dishes. They are a good source of the minerals manganese, potassium, copper and phosphorus, and deliver a hefty dose of calcium. Kidney beans should always be cooked thoroughly, as the raw bean contains phytohaemagglutnin, a potentially toxic compound that is eliminated via proper cooking. Serving suggestions: Kidney beans are great in salads, soups and chili. They are also an excellent main ingredient in veggie burgers. Black beans, like other bean varieties, are full of fiber, minerals and phytochemicals, but they may also be especially good at supporting the digestive tract. A 2002 animal study published in Nutrition and Cancer revealed that black beans lowered the risk of colon cancer tumors, by allowing good bacteria in the colon to efficiently produce butyric acid—a process that helps them thrive. Serving suggestions: Black beans can be used to make hearty soups and rich dips, and are a great addition to taco fillings. You can even find chocolate cake and brownie recipes that include black beans. Navy beans are small, creamy-white beans that were a staple food for the US navy in the early twentieth century, hence their name. Navy beans are a great source of vegetarian protein, with one cup supplying 15 grams of protein—with all of the essential amino acids except taurine. Serving suggestions: Navy beans are perfect to make a delicious variation on traditional chili. They hold up well in soups, and can even be used to make gluten-free cakes and muffins. Black-eyed peas are actually not a pea at all but a white bean with a black dot. They boast hefty amounts of antioxidants, potassium and folate, and folks in the Southern US believe eating them at the turn of the New Year helps to bring good luck. These are fast cookers, from 30 to 60 minutes. Serving suggestions: Black-eyed peas can be tossed with tomatoes, peppers, herbs and a bit of oil and vinegar to make a cold salad. The most traditional use for black-eyed peas is in the Southern dish hoppin’ John, where they are tossed with rice and Cajun seasonings.